Photo: Brown Pusey House (Community Center), ca. 1825, 128 North Main Street, Elizabethtown, KY. Listed on the National Register of Historic Places in 1974. Photographed by User:Nyttend (own work), 2011, [cc0-by-1.0 (creativecommons.org/publicdomain/zero/1.0/deed.en], via Wikimedia Commons, accessed April, 2014. Hardin County administrative offices are located at 14 Public Square, Elizabethtown, KY 42701; phone: 270-765-2171. Hardin County was established in November of 1792 and became an official county on February 20, 1793. The first court house was constructed at a cost of $220.00 in 1795. Forty men chopped down enough trees to build the "round log" court house in one day. 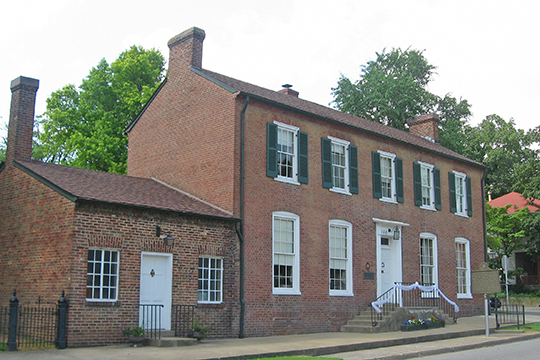 Elizabethtown was established as the county seat in 1797. That same year, the court decreed that a new jail be constructed along with a whipping post and stocks for the punishment of minor crimes. The county is named after Colonel John Hardin, an Indian fighter who had been killed by the Indians while on a peace mission with the Miami tribes in Ohio. Original Hardin County encompassed 4,000 square miles. All or parts of twelve other counties have been formed from this original area. Breckinridge, Daviess, Grayson, Hancock, LaRue, Meade, and Ohio Counties were formed from original Hardin County, as well as parts of Butler, Edmonson, Hart, Henderson, and McLean Counties. The boundaries of the original area were the Ohio, Salt, Rolling Fork, and Green Rivers. Today Hardin County consists of more than 600 square miles and is the fourth largest county in Kentucky in terms of land area. The County is bordered on the north by the Ohio River, Bullitt County and Meade County; on the west by Breckinridge, Grayson, and Meade Counties; on the south by LaRue, Hart, and Grayson Counties; and on the east by the Salt and Rolling Fork Rivers and by Bullitt, Nelson, and LaRue Counties. Hardin County Planning and Development Commission, Planning for Growth: Comprehensive Development Guide 2008, www.hcky.org, accessed May, 2012.